Since it opened on October 4, 1914, the Central Station was the bustling hub of the Illinois Central Railroad between New Orleans and Chicago. More than just a building, it has tremendous historical significance. This point where north and southbound tracks converged was where many African-Americans gathered from their homes in the Mississippi Delta to make their way northward for jobs and a better life. During the Great Migration from 1940 to 1970, over 5 million people left mostly rural areas for industrial cities like Chicago, Detroit, Philadelphia, and Cleveland. Along with the migrants, flowed Black culture–like jazz, blues, and gospel–that was assimilated into the northern cities. Painter Jacob Lawrence depicted the mass migration of African-Americans from the rural South to the urban North in his Migration Series. He painted the 60 panels on cardboard, and when they were exhibited at the Museum of Modern Art in New York it brought him national recognition. They are currently part of the Phillips Collection in Washington, DC. When Amtrak took over passenger service throughout the U.S. in 1971, they only used a portion of the Memphis Central Station so the building fell into disrepair. Considered one of the worst stations in the system, it was nearly demolished like the Union Station before it. Fortunately, the building was saved in the 1990s by The Memphis Area Transit Authority who spent $23.2 million dollars on its redevelopment. Currently there are condos on the top floors, but the station is still used by Amtrak for their twice-daily City of New Orleans line. Central Station also played a part in helping people who were fleeing a natural disaster. In August, 2008, as Hurricane Gustav threatened the Gulf Coast, New Orleans began evacuating residents from the city and a thousand evacuees arrived in Memphis on Amtrak. Trying to learn from Hurricane Katrina three years earlier, it was part of the largest evacuation in Louisiana history. Also occupying the same building is the Memphis Railroad & Trolley Museum who have events planned this weekend, including concerts, an Amtrak exhibit, tours of a classic Norfolk Southern rail car, and a look at the Trolley Shop. It’s great fun for anyone interested in the rich rail history of Memphis. 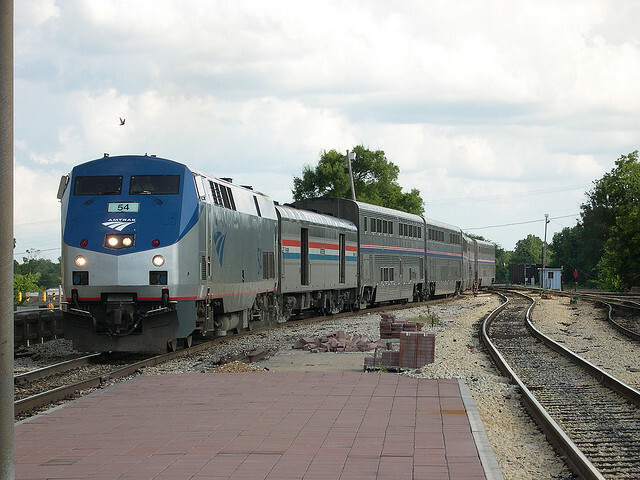 If you have a little extra time on your vacation or simply enjoy the relaxed pace of a rail trip, consider taking the Amtrak to Memphis. The most direct route follows the Mississippi River down from Chicago in the north, or up from New Orleans in the south. The Amtrak map makes it look as if Memphis is equal distance between the two, but it’s actually a few hours closer to New Orleans on the route called The City of New Orleans. Amtrak also offers an interpretive program in conjunction with the National Park Service called Trails and Rails. Guides and guest artists on board the train help give you a better appreciation for the natural surroundings along your trip.